Southampton, PA —AdvantaPure is pleased to announce that its AdvantaFlex biopharmaceutical grade TPE is now offered as molded Tri-Clamp® fittings, BioClosure® container sealing systems, and connections such as wyes, tees, crosses, and reducers. Previously available only in tubing form, this new development allows entire single-use molded manifold assemblies to be manufactured from TPE (thermoplastic elastomer). "AdvantaFlex has been gaining ground in the market thanks to its superior pumping, heat sealing, and welding capabilities," notes John Stover, AdvantaPure's Product Technical Director. "The addition of molded connections and container seals makes it that much more attractive to customers who need an alternative to silicone but still want a batch fill or sampling manifold with molded connections and only one fluid contact surface." One reason a single resin system is desirable is because it helps avoid operator errors. 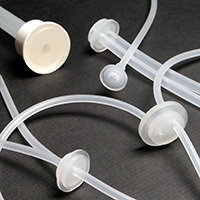 Other tubing often involves splicing sections of silicone tubing into a process line to run it through a peristaltic pump. Mistakes are made when the wrong tubing is then inserted into the pump, resulting in wasted product, time, labor, and significant dollars. Using one material like AdvantaFlex for an entire single use system eliminates such errors. It also means that only one resin validation is required. Another benefit is the elimination of barbed fittings and their possibility for leaks and contamination. Molded connections provide a crevice-free, seamless transition for continuous, unrestricted flow. Rough-cut cable ties and their potential for damage are also removed from these critical biopharmaceutical and pharmaceutical process applications. 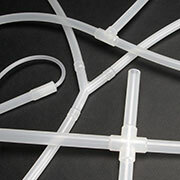 All AdvantaFlex tubing assemblies are custom made to specifications. Molded AdvantaFlex is available now as wye (Y), tee (T), and cross (X) connectors, as well as reducer connectors. Both mini and standard hygienic clamp unions (commonly known as Tri-Clamp or sanitary ends) are also offered. All styles range in sizes from .125" I.D. to .750" O.D., and other sizes are in development. BioClosure container closures made from AdvantaFlex are available as caps with or without tubing and provide biologically safe, secure seals for vessels of glass, plastic, or metal. For more information on AdvantaFlex's new molded options, contact the AdvantaPure team at 145 James Way, Southampton, PA 18966; phone 888-755-4370 or 215-526-2151; fax 888-258-4293 or 215-526-2167; e-mail: sales@advantapure.com.